I had borrowed Cold Mountain from a friend way back in April, and now, close to the end of August, I have finally gotten around to watching it. Yes, I know I may just be the slackest person ever. Oh, and I should probably tell you that I didn't watch it just because Cillian Murphy is in it for two minutes. I watched it because it basically looked like an R16 version of Gone with the Wind. And no, I don't mean that in a bad way. 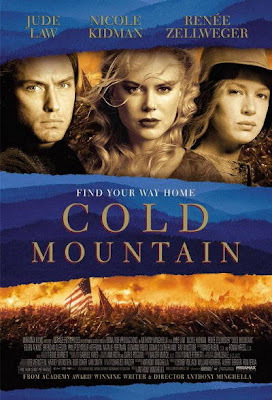 We follow the story of a wounded Confederate soldier named Inman (Jude Law) who struggles on a perilous journey to get back home to Cold Mountain in North Carolina, as well as to Ada (Nicole Kidman), the woman he left behind before going off to fight in the American Civil War. Along the way, he meets a long line of interesting and colorful characters, while back at home, Ada is learning the ropes of managing her dead father's farm with Ruby (Renee Zellweger), a scrappy drifter who assists and teaches Ada along the way. People always go on about how Cold Mountain was made just as an Oscar movie. That could be true, as it reeks of Oscar, but who says that is a bad thing? The film deserved Oscars. The performances from all of the ensemble cast, but especially Zellweger, were all pitch perfect and somewhat true to the time period as opposed to the modern take many stars try to bring to stories like this. It's one of the most classically done period pieces that would still appeal to the modern audience. A lot of period films that have come out in the past ten years have either succeeded in capturing the period but not the audience, or capturing the audience but not the time period. Cold Mountain so wonderfully does this, with it's brutality and also an interesting love story. Amazingly, this is the first love story which I have enjoyed in a while. Forget that new comedy Going the Distance, Ada and Inman show you how the long distance relationship is done. Their relationship was so interesting that I was shocked to tears in the end...not something that a romance does easily for me. This movie is just so beautiful through and through, and does well to capture the hardships and horror cause by the Civil War. I do like to think of this as the film Gone with the Wind would have been if it had been made in more recent times. A beautifully made and acted film, a classic romance that will sweep you away yet shock you to the core.